Tn3270 Terminal Emulation • ZOC TN3270 for Windows 10 and macOS lets you access IBM zSeries mainframes via 3270 Telnet and SSL. 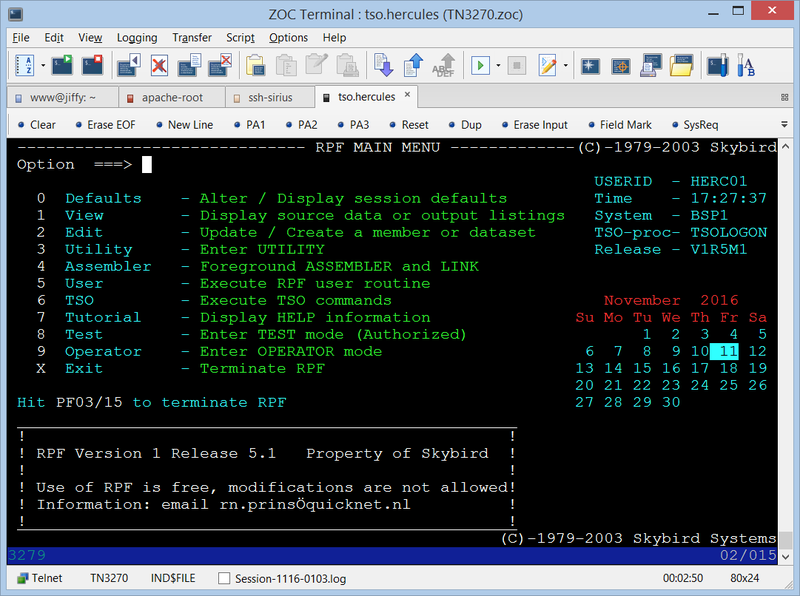 ZOC Terminal is a professional and feature-rich TN3270 terminal emulator which lets you access IBM zSeries and iSeries mainframes via normal or secure (SSL) telnet connections from a Windows PC or Mac. Overview: TN3270 is a terminal emulation standard developed by IBM to access Mainframes. Mainframes are large servers which are mainly used by businesses for large scale data processing. They can be used by thousands of users at the same time, but they need to be accessed through so-called terminals. In the past true IBM 3270 terminals were often used for this purpose, but with the advent of personal computing the use of terminal emulation software like ZOC (on a computer running Windows or macOS) became the norm for TN3270 mainframes access, because it is considerably more cost effective than using genuine IBM terminals or even IBM 3270 emulation software. What is an IBM 3270 (TN3270) Terminal? The IBM 3270 is a series of block oriented computer terminals (sometimes called display devices) made by IBM. They were originally introduced in 1971 and they were used to give users access to programs running on on IBM mainframes. Unlike popular character-oriented terminals of that time (like VT220 or ANSI), the 3270 minimizes the number of I/O operations over the network between terminal and mainframe, but it requires more computing power inside the terminal itself to handle the complexity of the 3270 protocol (six years later, IBM also introduced a similar but less complex terminal, intended to access IBM's midrange computers, this terminal was then called 5250). The 3270 series was designed to connect with mainframe computers, often at a remote location, using the technology then available in the early 1970s. The major design goal of 3270s are minimizing the amount of data transmitted. In a data stream, both text and control (or formatting functions) are interspersed allowing an entire screen to be transmitted between the server and the 3270 terminal as a single output operation (originally using coaxial cable network, later via ethernet and then TCP's telnet protocol TN3270). Since Token Ring connections are no longer in use these days, today TCP/Telnet is mostly used as a transport, hence the emulation is now also often named in conjunction with the Telnet transport and called TN3270. Although IBM no longer manufactures physical 3270 terminals, the IBM 3270 protocol is still commonly used via terminal emulation to access mainframe-based applications, especially in large organizations like banks or insurance companies. As mentioned, the IBM 3270 is a class of block oriented computer terminal, while the popular VT220 is character oriented. With block oriented terminals like the 3270 (or 5250), exchange between terminal and server is based on whole screens. This is akin to the server sending a form to the user, where the user can fill data into the various fields of the form without interaction between terminal and server and then sending the whole data back in one block. This requires some computing to be done on the terminal, because the 3270 terminal needs to control the input (e.g. restrict data to be filled only into a screen location where the screen form has an input field). Using a method known as "read modified", a transmission back to the mainframe contains only those fields in the 3270 terminal screen, where the user made changes. This technique lowers the load on the CPU and generally minimizes the amount data transmitted over the network between the 3270 terminal and the mainframe. Character oriented terminals like VT220 or xTerm are quite different in that regard, because they transmit every single user keystroke to the server and the server computes the proper response (e.g. the server checks for each character if the character which the user typed into the VT220 terminal makes sense in the given position on screen). This has some influence for terminal emulator software. Emulating an IBM 3270 terminal is a lot more complex, because that type of terminal does more 'work' in the terminal itself (work that needs to be duplicated in the emulation software). Emulating a character based terminal is an easier taks, because it just needs to send every keystroke to the server and act upon the response. Because of the complexity of the TN3270 protocol, most standard Linux/Unix oriented telnet clients can not be used to emulate TN3270 terminals. ZOC however offers an industrial strength implementation which matches the stability and features of IBM's own TN3270 emulator at a fraction of the cost and thus should be your choice if you need to access IBM mainframes via a telnet or SSL connection (remote connection protocols that make it possible to connect a PC to a server) using the TN3270 and TN5250 emulations. The ZOC TN3270 Telnet Client includes a number of powerful features. It is highly configurable and includes common terminal features such as full keyboard redefinition and user defined on-screen buttons. It also offers some very advanced and unique features such as a powerful script language and automatic triggering of actions based on received or typed text. Besides that, the ZOC Terminal also supports common emulations like vt102, vt220, Wyse, TVI, and Sun's CDE as well as IND$FILE file transfer. Read more about our TN3270 ZOC Terminal Emulator, check its feature list, look at our screenshots or start your free 30 days of evaluation today and download ZOC Terminal V7.23.3 now.